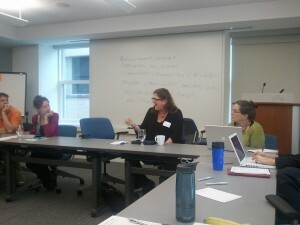 The Stockton family ran a number of sessions at ThatCamp Philadelphia, including Deb Gussman’s session on small scale publications and digital editions. Gussman is doing a digital edition of the works of Catharine Maria Sedgwick. Deb’s steps of a digital project: Strategy and Approach, Scope, Content, Design, Development, Testing, Support. Collaboration is very important. Need to find others who have skills you don’t have. There are no guarantees that apps, websites, etc will work in a year. I suggested the use of emulators ala what is done in modern times with classic interactive fiction. Deciding on what app/website/cms to use can often come from other colleagues/friends. I brought up the work of Cory Doctorow and how, by releasing his work under a Creative Commons license, readers can create versions of his works for different platforms. It is helpful to be familiar with remix culture in general. A great idea from John Theibault: in grant applications, include money for development of emulators for later editions when platforms become obsolete. Creative Commons licensing allows others to care more about the preservation of your work than you do. A lot of Gussman’s work with Sedgwick is coming from Google Books. Theibault’s students digitized Philadelphia’s directories. Back in 2003, I worked on the digitization of the American Weekly Mercury in one of Tom Kinsella’s classes. 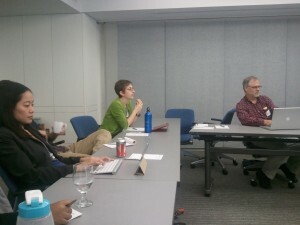 Adeline Koh, John Thebault, and Rebecca Goldman listen to the discussion.